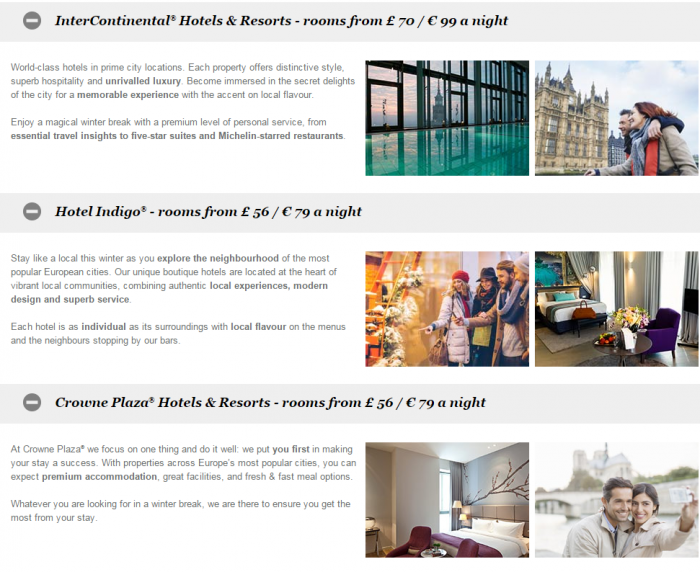 IHG Rewards Club has again launched their Europe up to 30% off Winter Sale for stays December 1 – February 29, 2016. You can book this rate up to 21 days in advance and minimum 3 days before your intended stay. Note that there are total of three different rate codes that you can check for each individual property and the discount us “UP TO” 30% off meaning that it obviously varies from property to property. Most of the business hotels are rather quiet around the Christmas and New Year holidays. Hotels tend to discount this period to drive in stays from leisure guest. It makes sense to check the rates under this offer and book if they are good. Book the IHG® Rewards Club Advance or Weekend rate between 00:01 local time on 18.11.15 and 23.59 local time on 07.02.16 for stays between 01.12.15 to 29.02.16 (inclusive) at participating European IHG Hotels. IHG® Rewards Club Members will receive a discount of up to 30 % off Best Flexible rate with prices starting from £ 35/€ 50 with prices starting from £ 35 when booking the IHG® Rewards Club Advance or Weekend rate at weekends. 30% discount from Monday night to Thursday night may vary. Offer only available to IHG® Rewards Club Members. Pre- book from 3 to 21 days in advance. Participating IHG brand hotels are included. Discount applies to every night of a stay. Quoted prices per room per night are based on a standard twin/double room (extra person charges may apply). Booking for individuals will be charged at the same rate. At Holiday Inn hotels only, up to 2 children under the age of 18 may stay in the same room at no extra cost when sharing with up to 2 adults if suitable accommodation is available, at the sole discretion of the hotel, if hotel is notified at the time of booking. Full payment is required at time of booking on pre-paid rates and is non-refundable except where prohibited by local laws. Prices are inclusive of VAT where applicable. Blackout dates (when the offer are not available) may apply. Offer cannot be used in conjunction with any other offer, discount or promotion. IHG is confident that you won’t find a better price anywhere else. If you do find a cheaper price, then IHG’s ‘‘Best Price Guarantee’’ terms and conditions apply.